A map of this year’s dead zone off the coast of Louisiana. The red areas indicate waters with the lowest levels of oxygen. 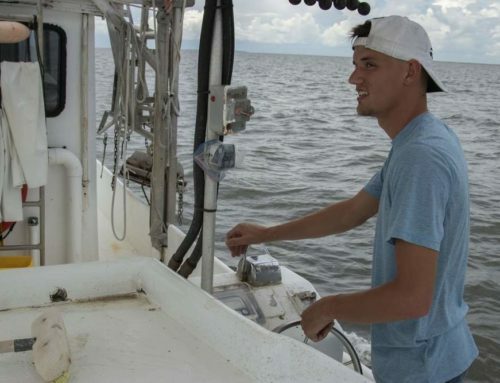 This year’s dead zone, an area of low- to no-oxygen that forms in the Gulf of Mexico off the Louisiana, covers an area the size of Connecticut, according to officials with the LUMCON marine research facility in Cocodrie. 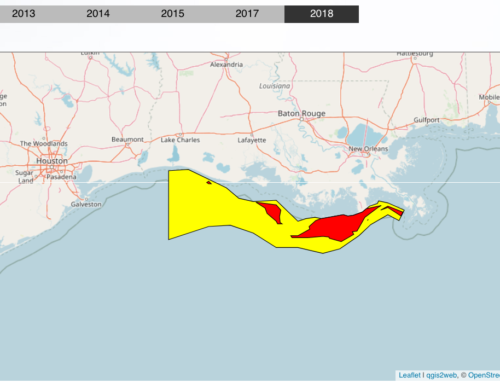 The dead zone covers a large area of the Gulf but is not as large as scientists originally predicted, according to Nancy Rabalais, executive director of LUMCON, the Louisiana Universities Marine Consortium, and head of the dead zone research cruise. Scientists measured this year’s dead zone at 5,840 square miles during a weeklong cruise that ended Sunday. The zone forms off the coasts of Louisiana and Texas each summer. 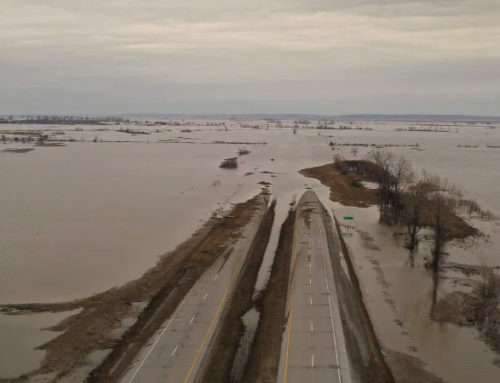 It is caused by excess nutrients from human activities such as large-scale agriculture being dumped into the Gulf from the Mississippi River. Those nutrients, coupled with the warm summer sun, trigger an explosion of algae growth that eventually dies, sinks and decomposes, consuming most of the life-giving oxygen in the water. Oxygen-starved waters create an inhospitable area of water that force organisms to flee or die. This creates large areas of dead sea that give the zone its name. Normally the low- to no-oxygen area is found closer to the Gulf floor where the decaying algae settle toward the bottom. This year researchers found many areas across the Gulf where oxygen conditions were severely low at the bottom and animals normally found at the seabed were swimming at the surface. 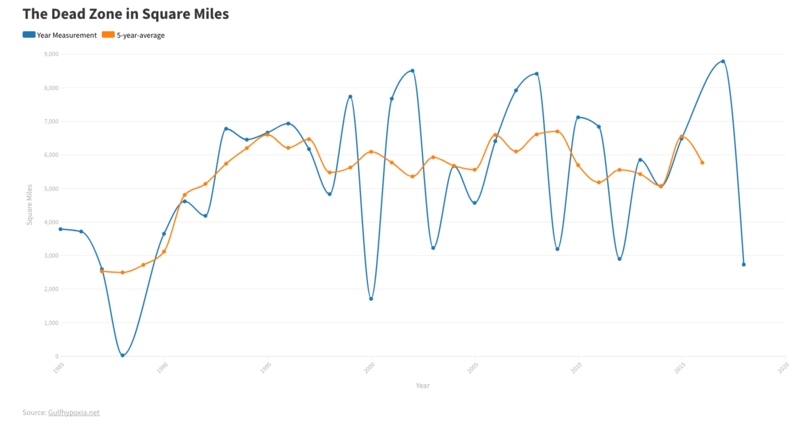 This year’s dead zone was a big change from last year’s when drought conditions resulted in the fourth-smallest dead zone on record at 2,880 square miles, about the size of Delaware. 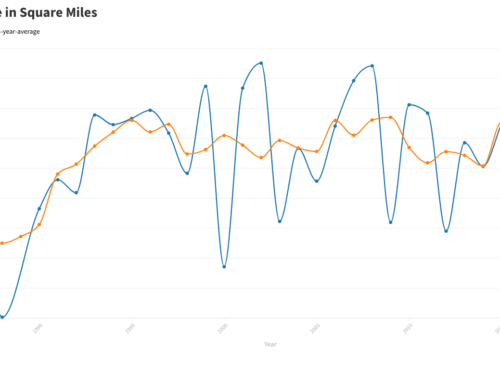 The average size of the dead zone over the past five years has been 5,176 square miles, more than twice the 1,900-square-mile goal set by the Gulf of Mexico/Mississippi River Watershed Nutrient Task Force in 2001 and reaffirmed in 2008. The multi-state, multi-agency task force was created to develop a plan to reduce the size of the dead zone. Officials with the Gulf Restoration Network, a nonprofit environmental advocacy group, said this year’s large dead zone is indicative of the lack of action by federal agencies such as the Environmental Protection Agency. 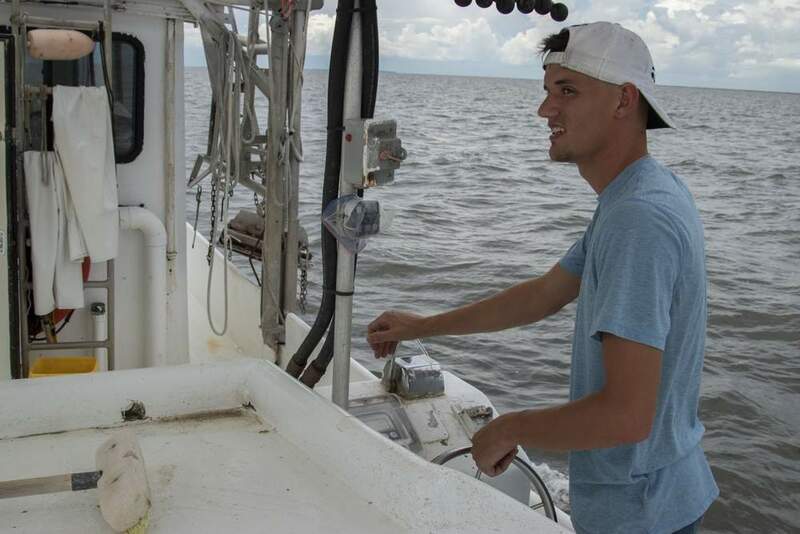 Despite voluntary initiatives to address the dead zone enacted by Louisiana and EPA, the Gulf dead zone has only grown bigger, Gulf Restoration Network officials said. The lack of action forced environmental groups to file suit against EPA in 2012 because the agency refused to set numeric standards for nitrogen and phosphorus, two sources of nutrient pollution that create the zone. The zone threatens an area of the Gulf that supports valuable commercial and recreational Gulf fisheries. In 2011, those fisheries had a commercial dockside value of $818 million and an estimated 23 million recreational fishing trips. 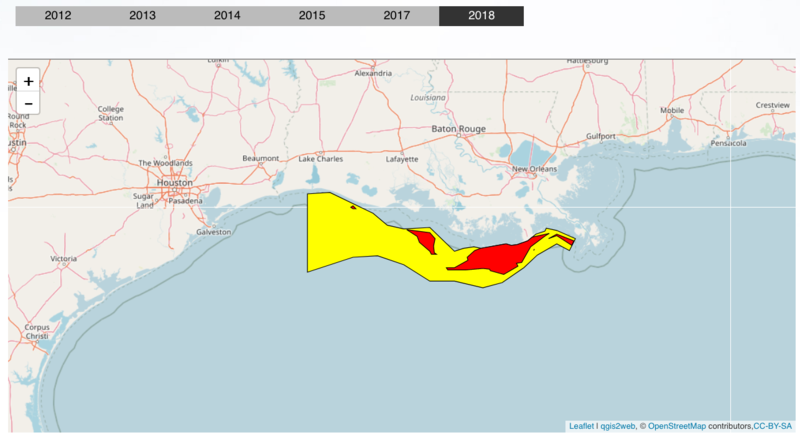 Officials said the dead zone’s impact creates a “ripple effect” throughout the Gulf’s fishing industry, forcing fishermen out of zone-affected waters, causing competition and crowding as fishing fleets search for unaffected areas. 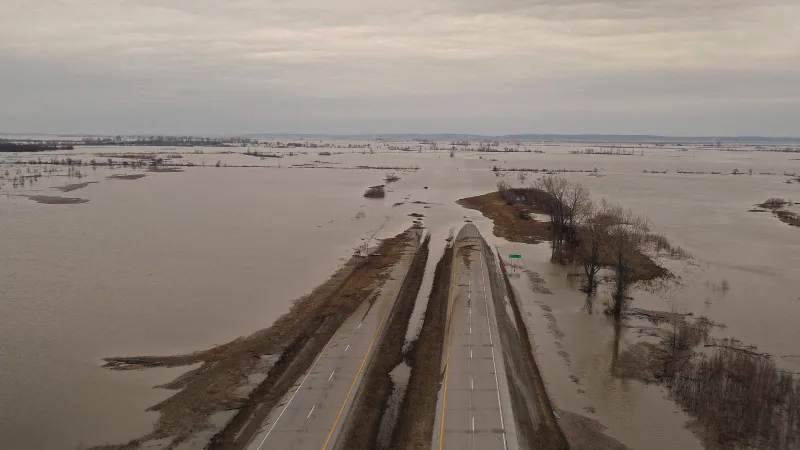 Nitrogen and phosphorus pollution causes environmental problems throughout the entire Mississippi River Basin, fueling toxic algae blooms resulting in the death of livestock and pets, fish kills and causing damage to drinking water supplies. 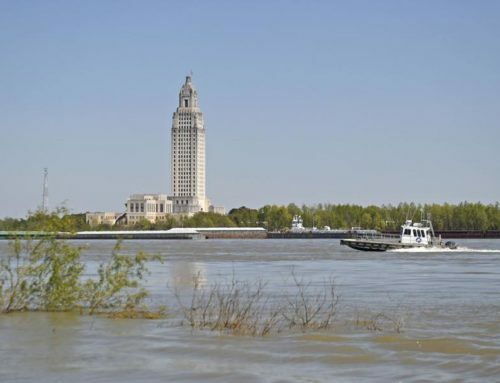 Recently, there also has been a debate regarding how nitrogen and phosphorus pollution will impact proposed sediment diversions and wetlands restoration projects in coastal Louisiana.